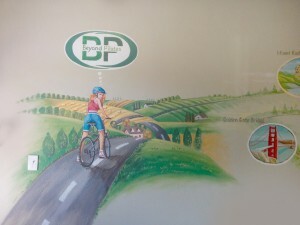 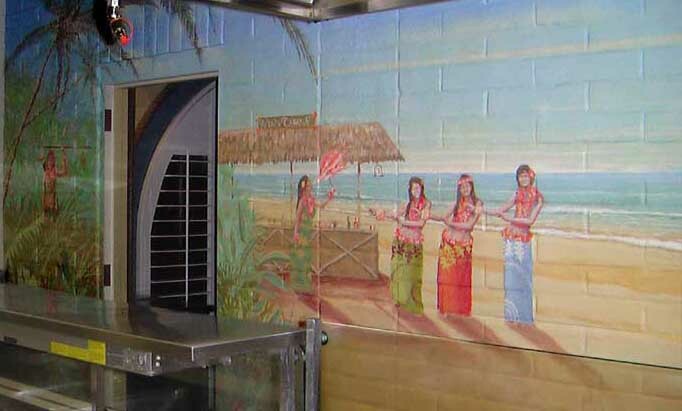 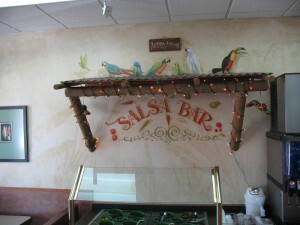 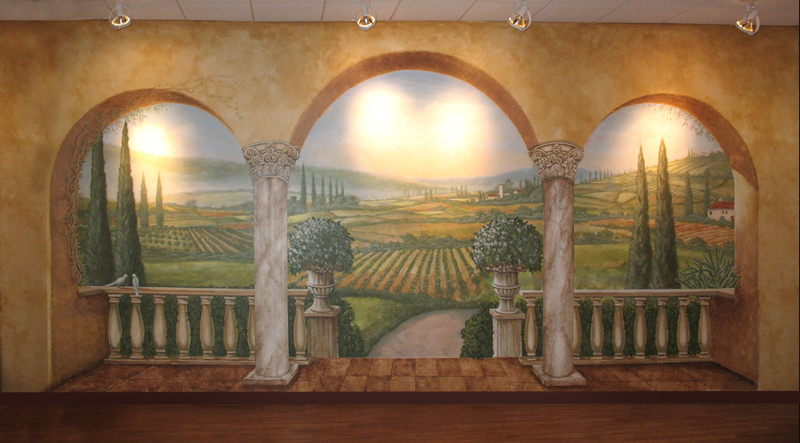 Commercial murals for businesses’ with brief explanations and also outlining the focus of each mural project. Location – Yorba Linda, California. 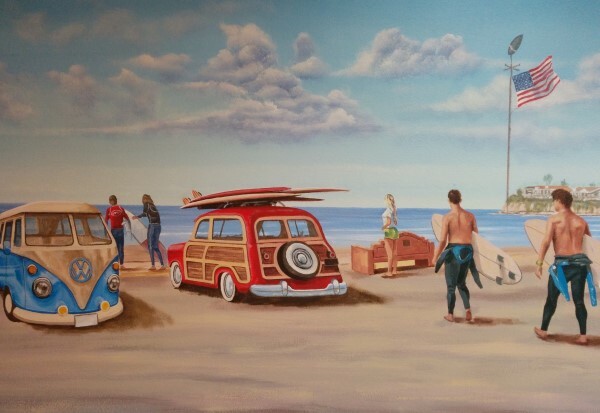 Los Angeles through Orange County. 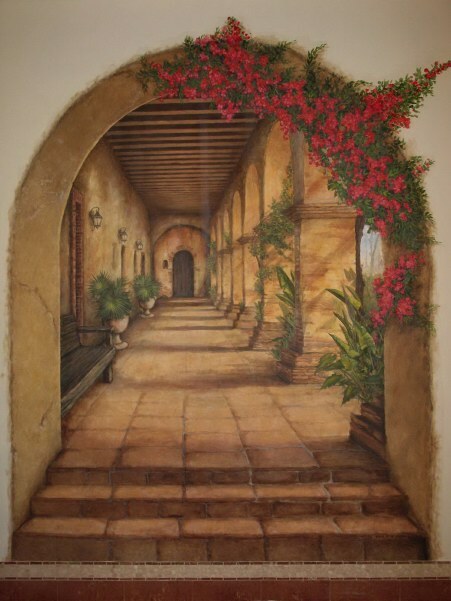 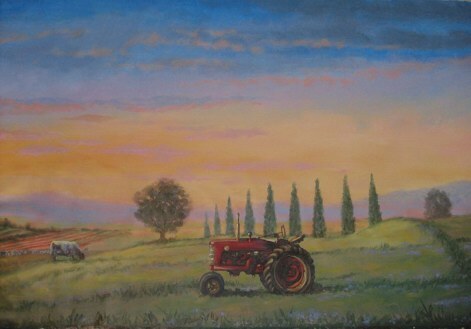 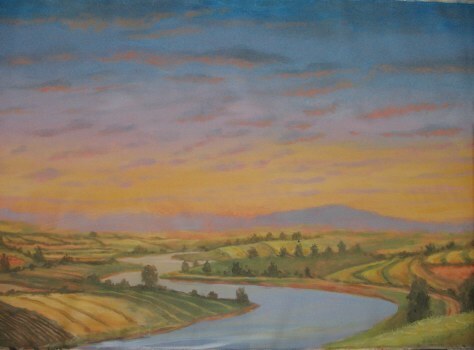 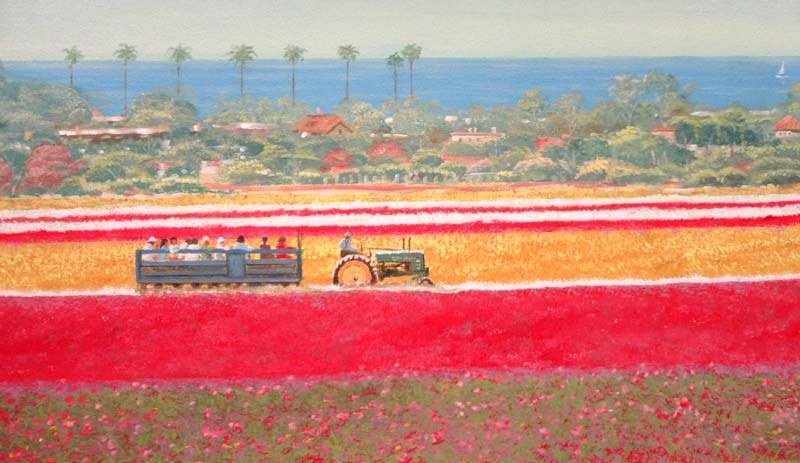 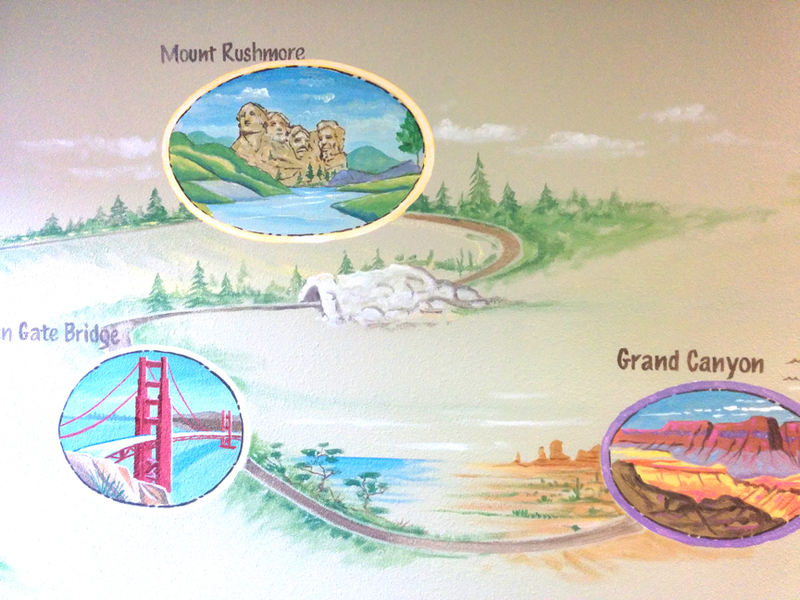 This was painted for a memory care facility in Yorba Linda, California. 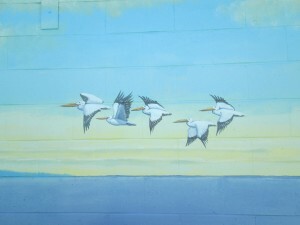 to designate the 5 different wings of the building so the patients could find their correct area. 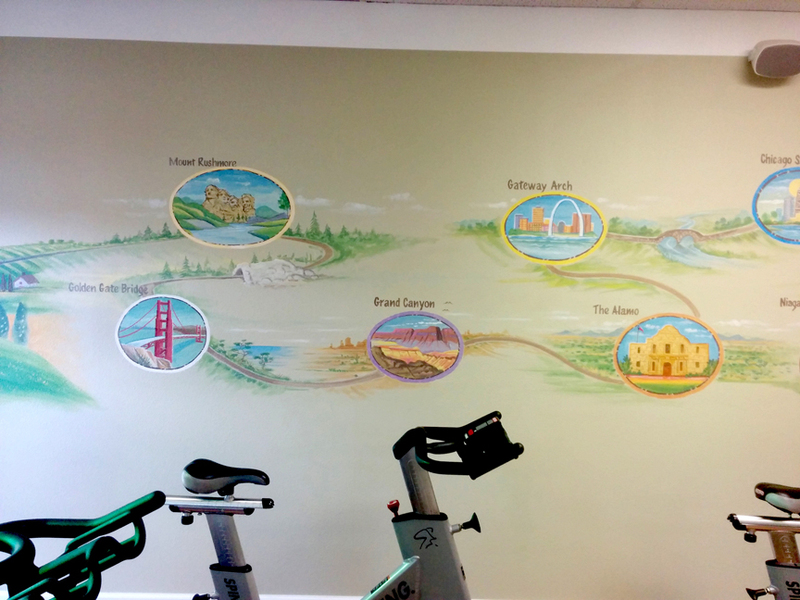 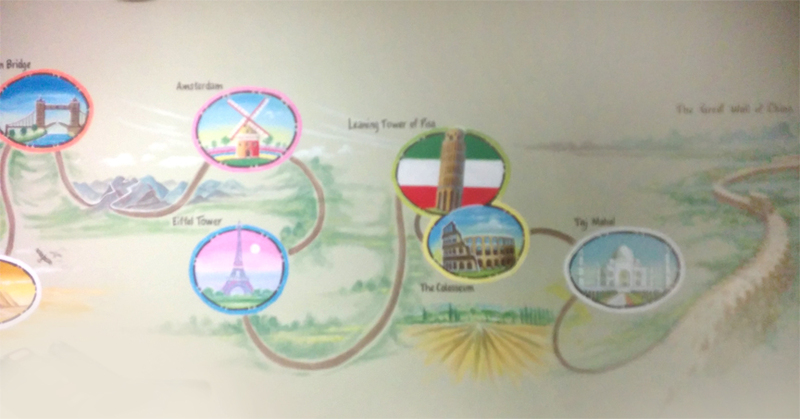 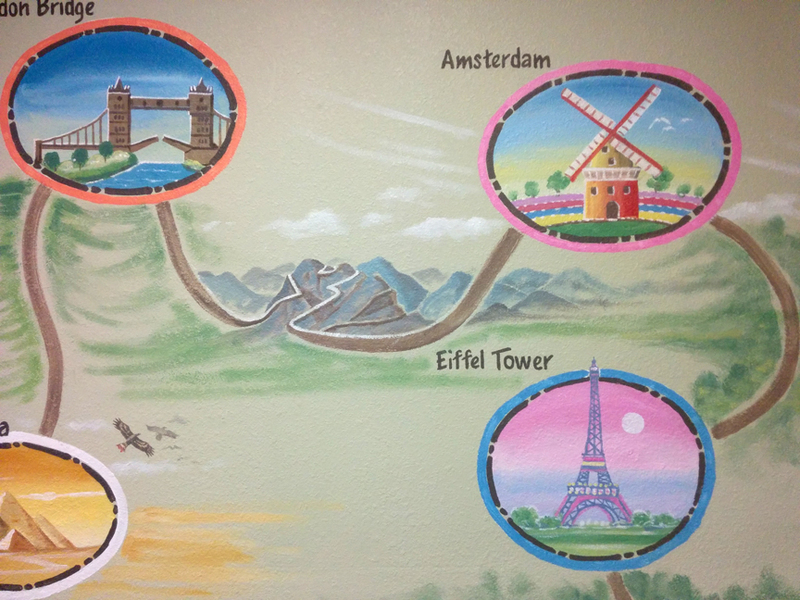 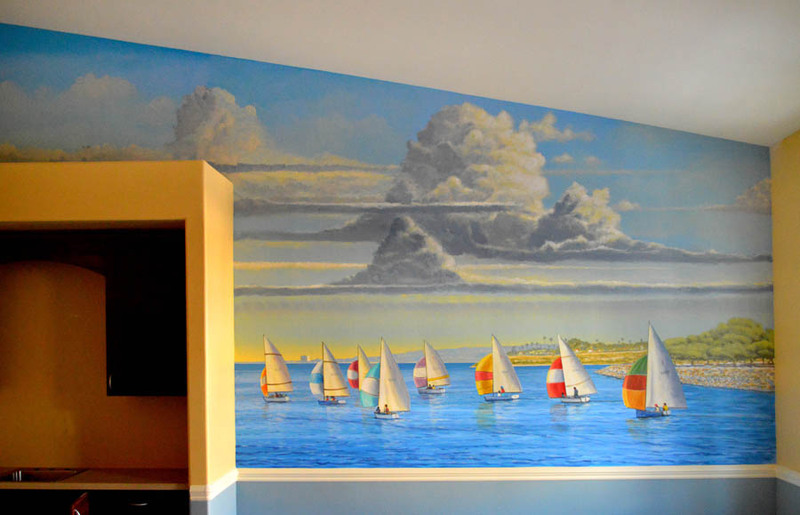 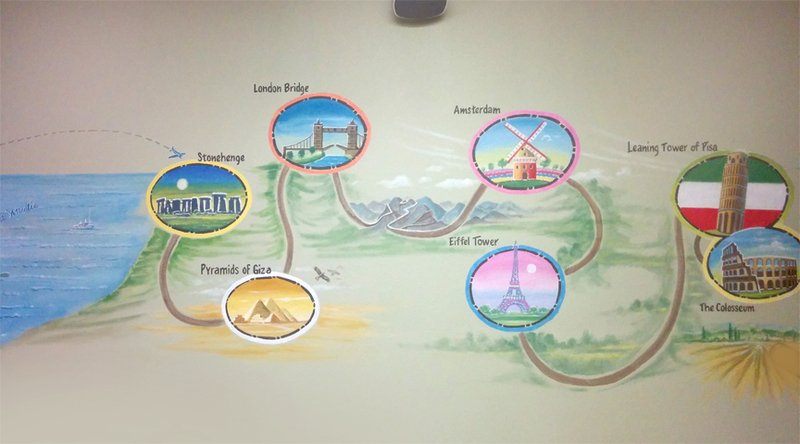 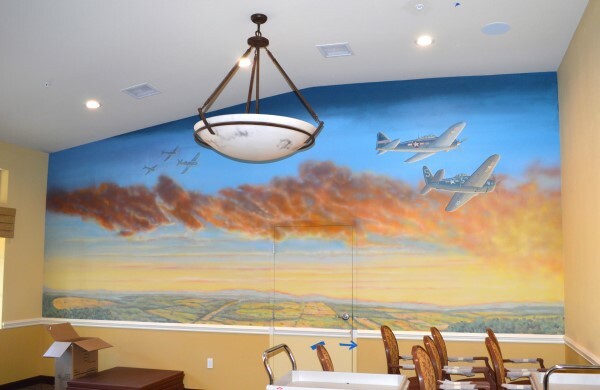 This mural was again painted for Activcare, a memory care facility in Yorba Linda, California. 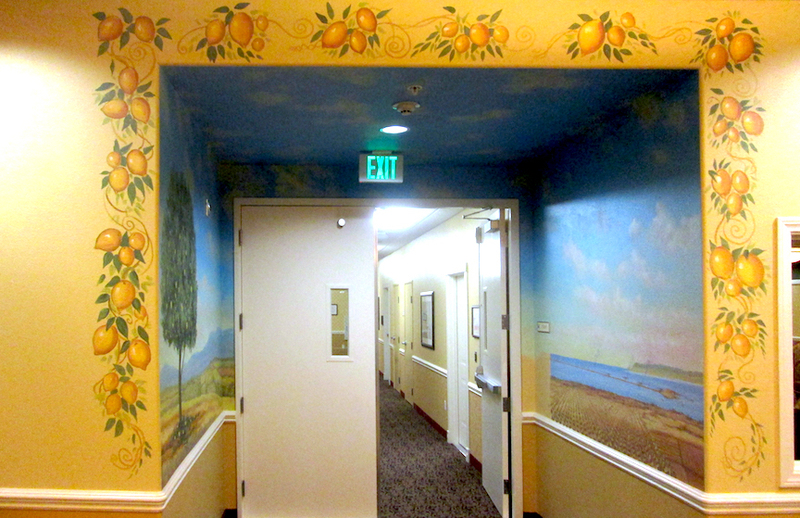 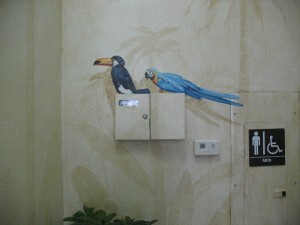 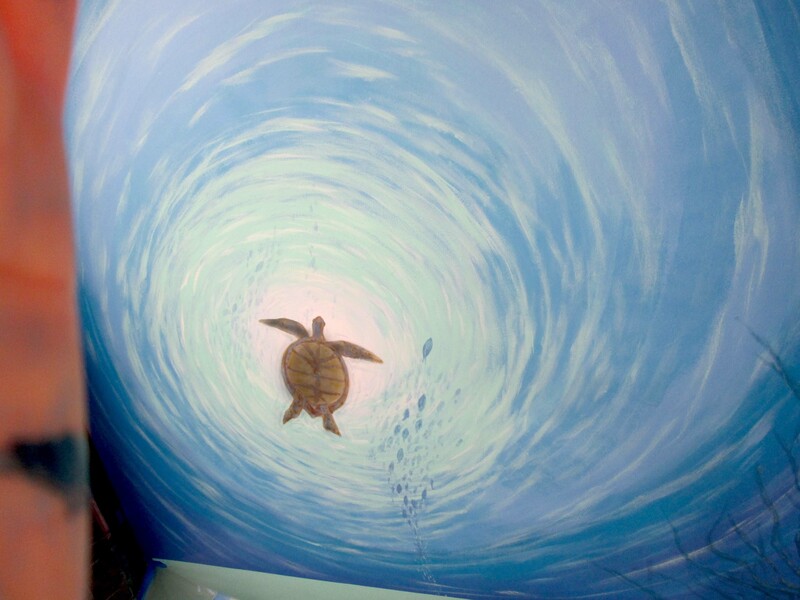 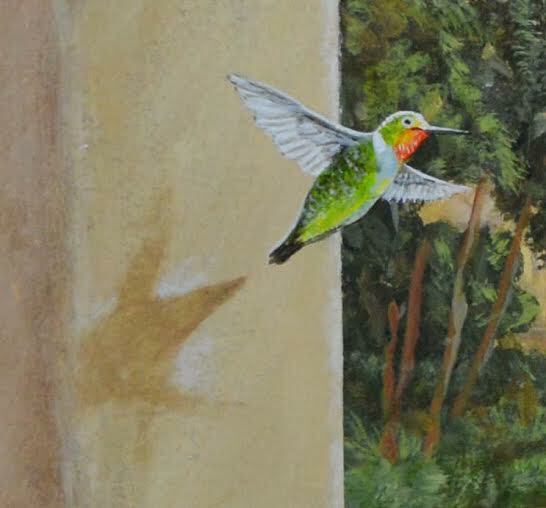 The 5 murals painted were to help residents locate their wing where their room is located. 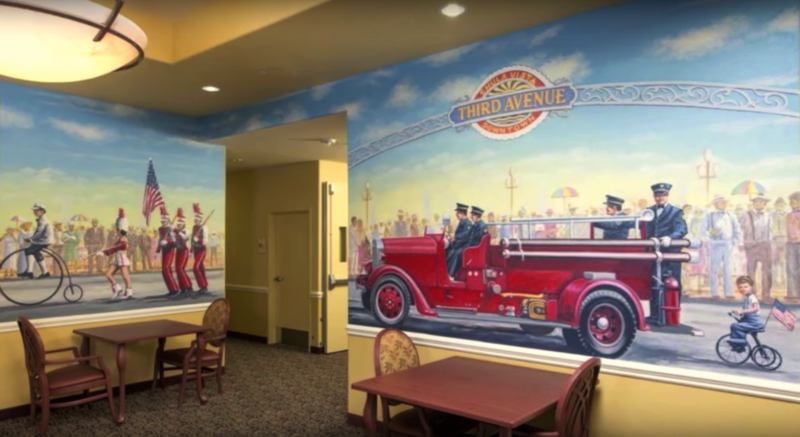 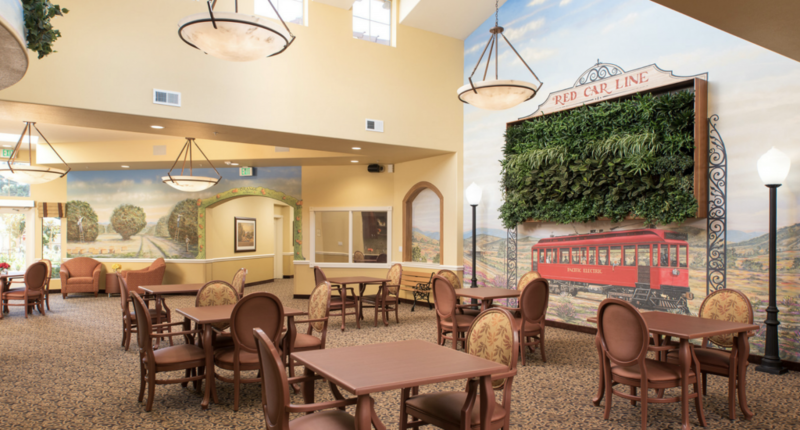 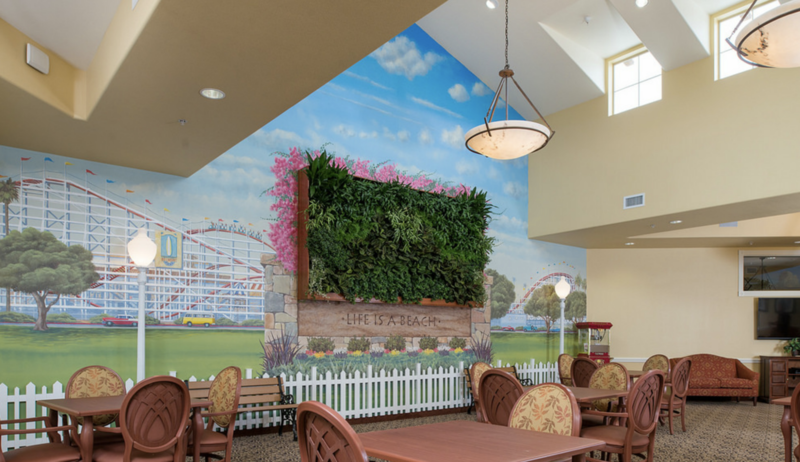 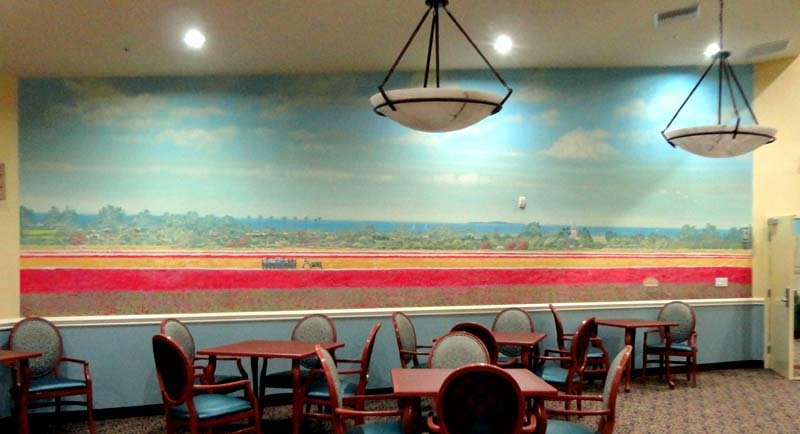 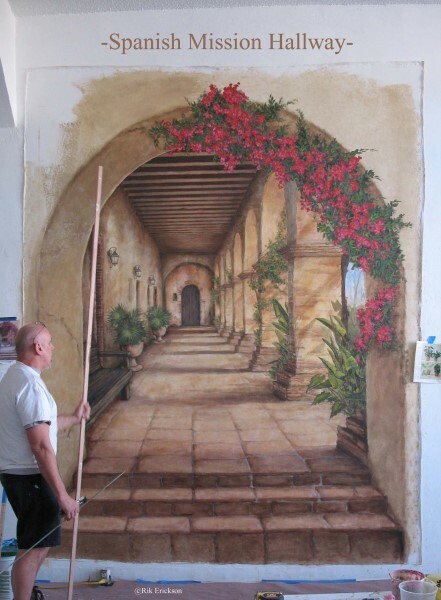 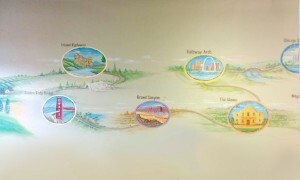 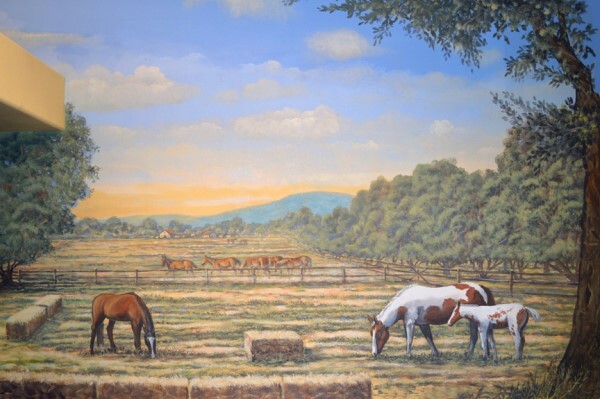 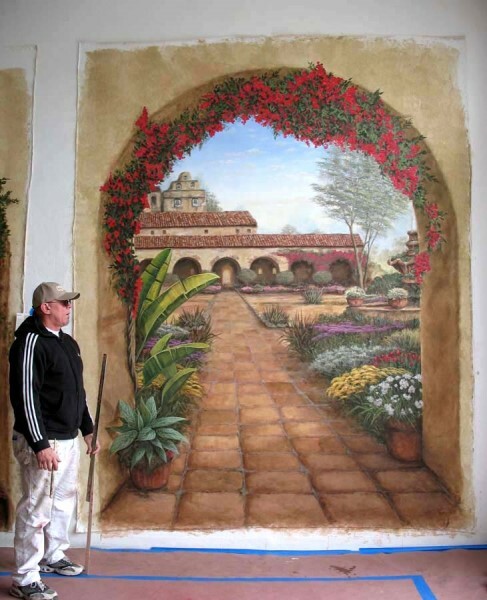 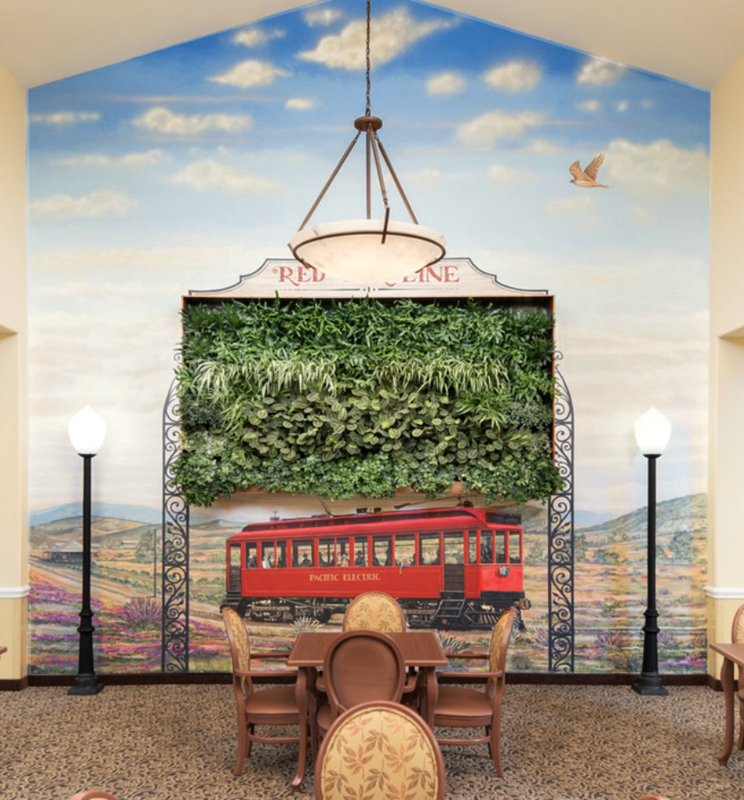 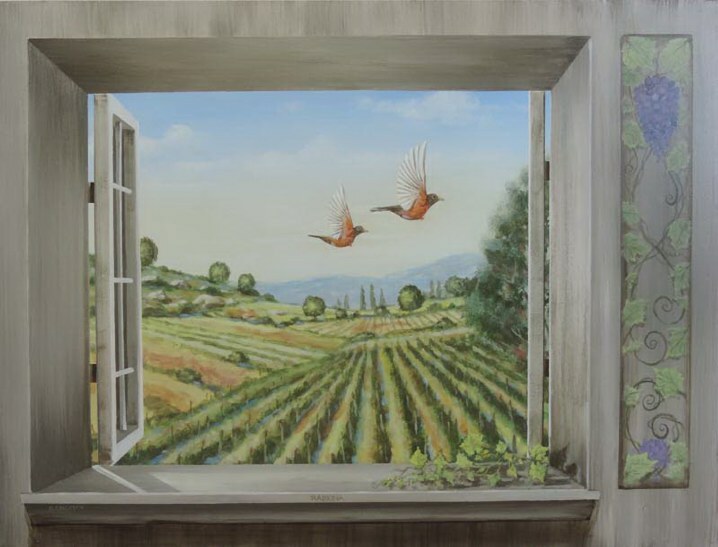 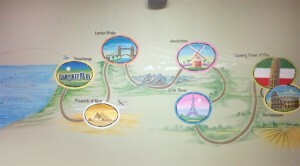 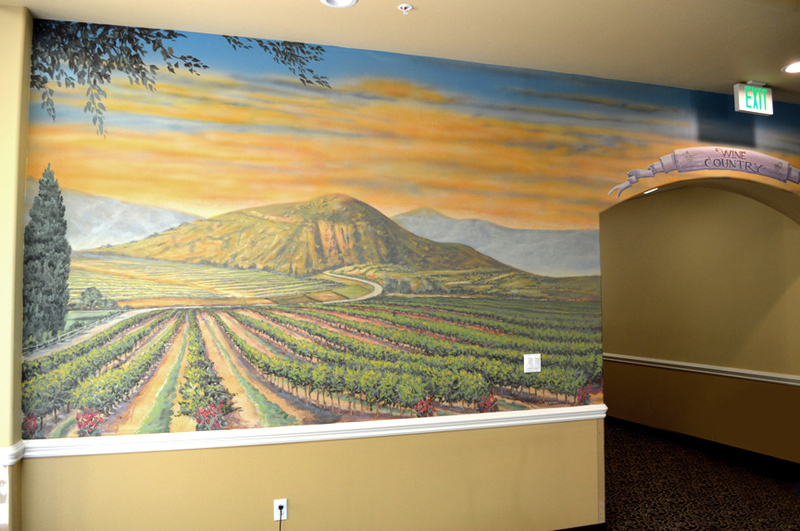 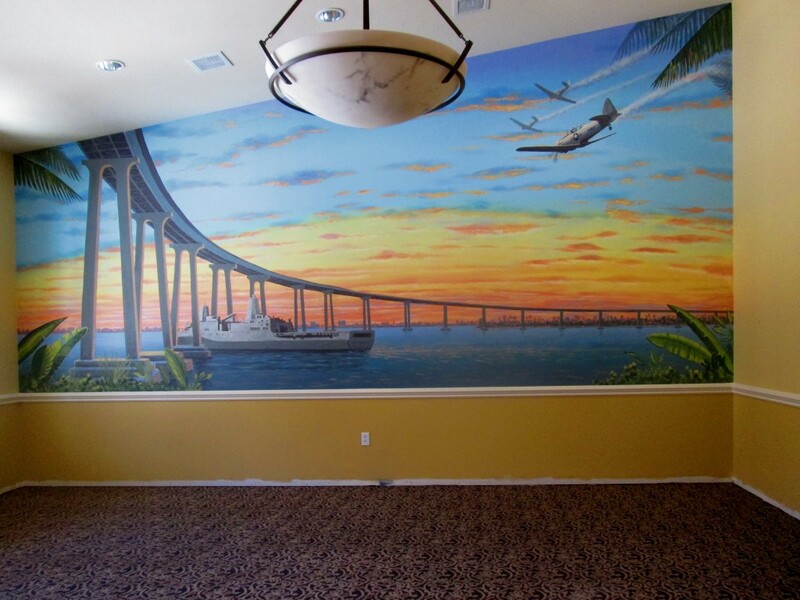 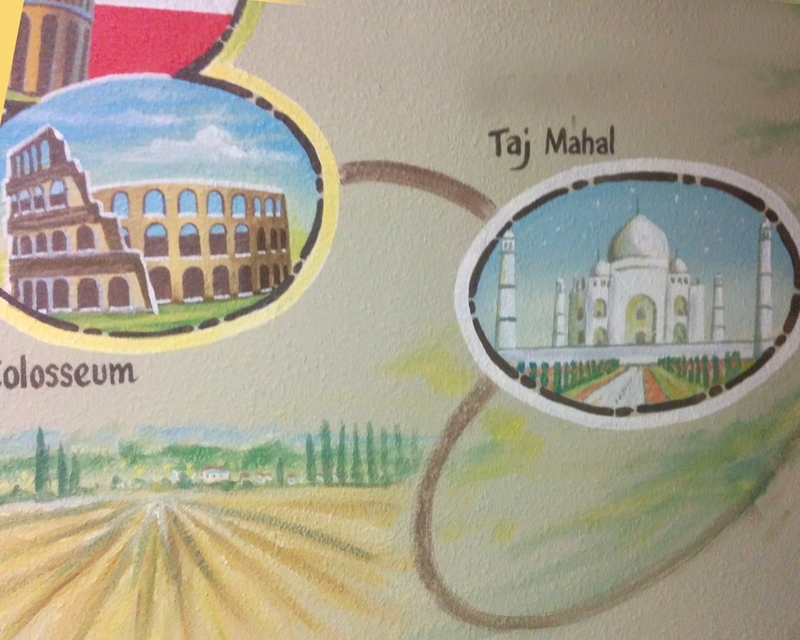 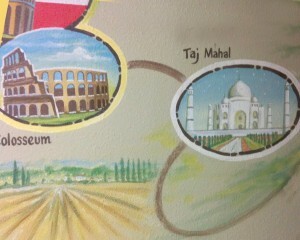 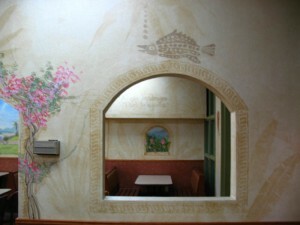 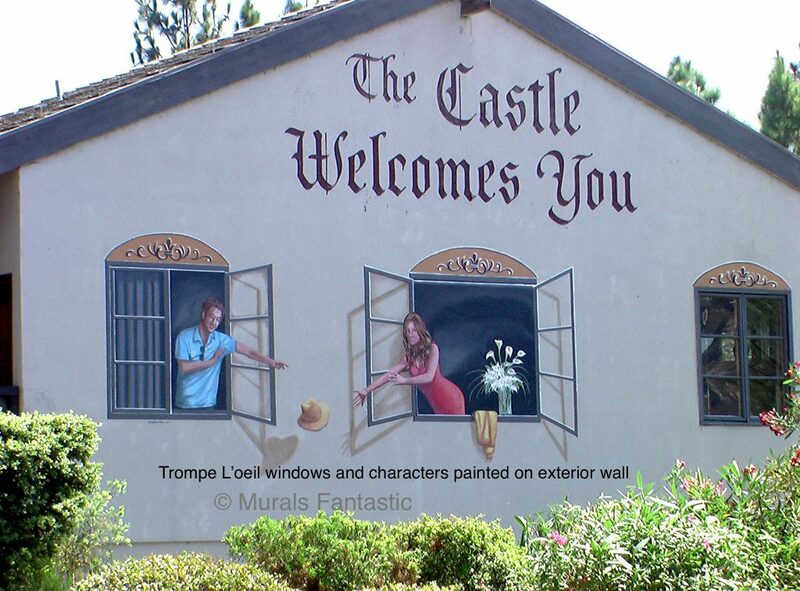 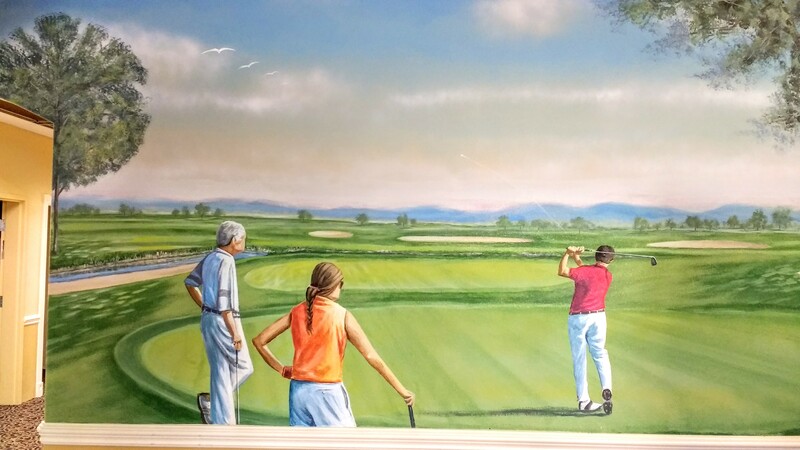 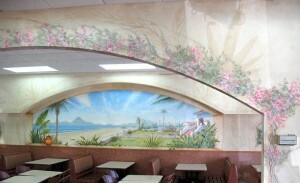 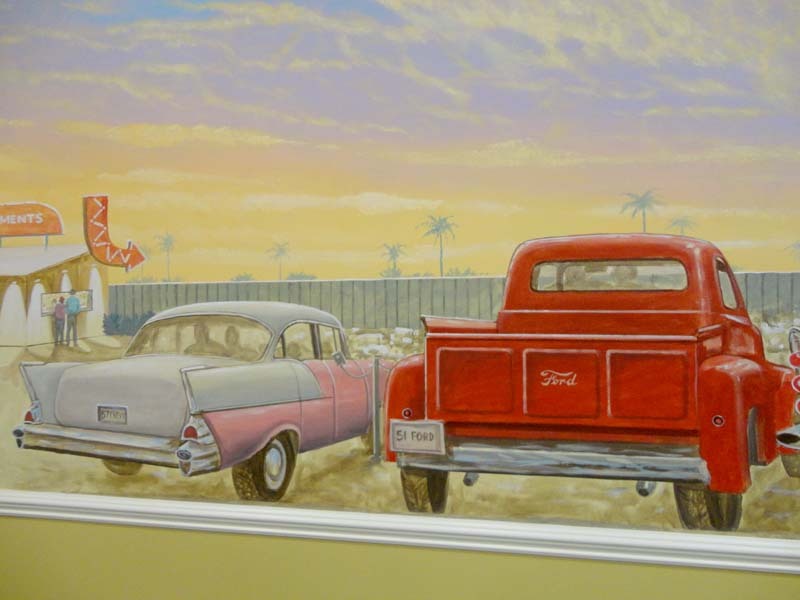 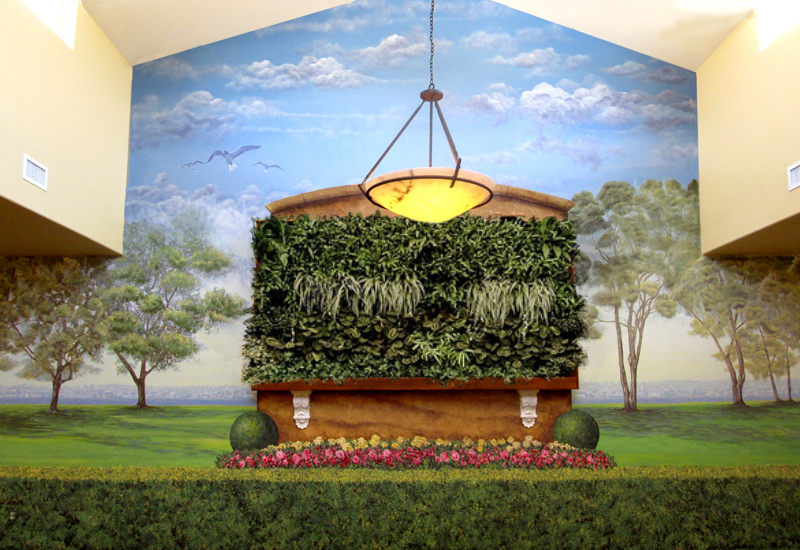 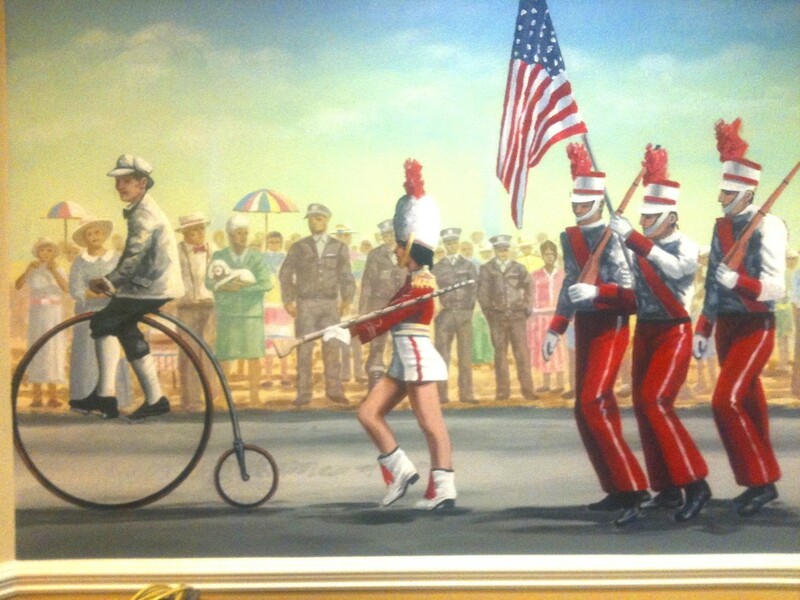 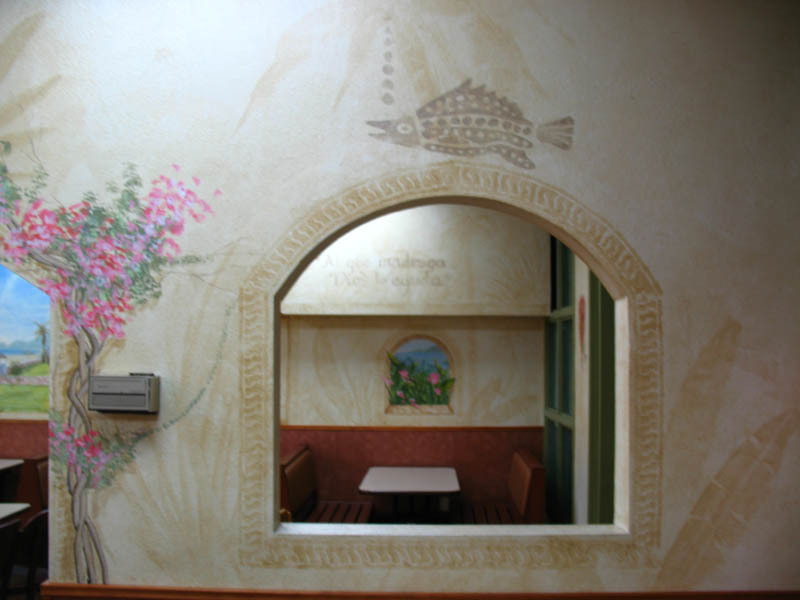 This mural was painted for a memory care facility located in Yorba Linda, Ca. 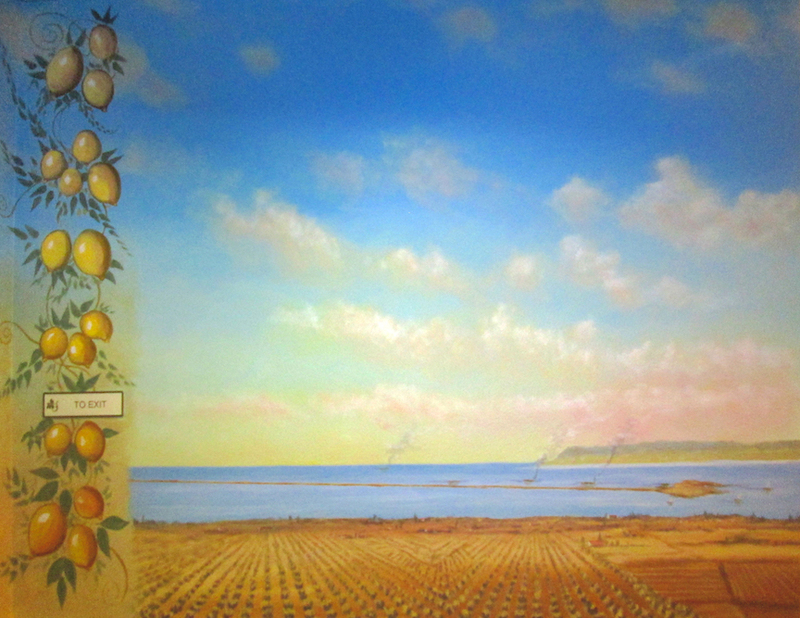 It is a rendition of what an old orange grove would look like in the early 1900’s. 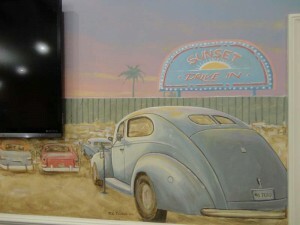 It is a rendition of a dirigible in the California sky with vintage bi-planes circling around. 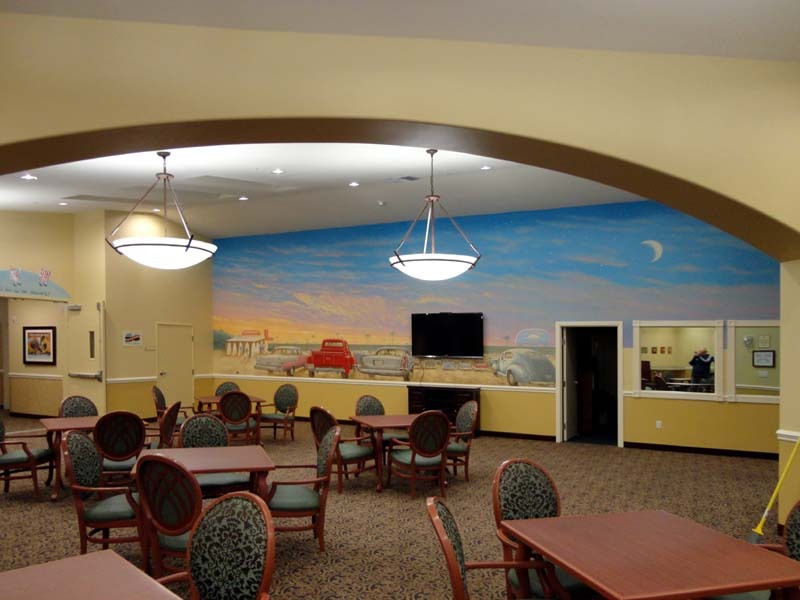 This mural was painted for the military veterans in the facility. 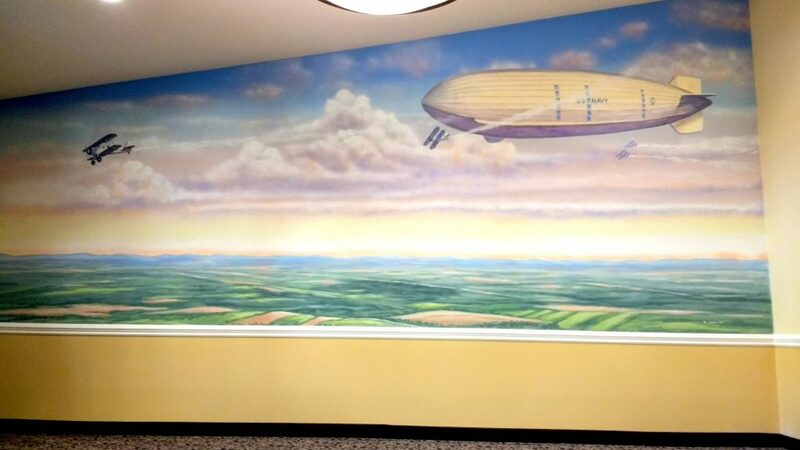 The area of Yorba Linda was known for it’s dirigible’s. 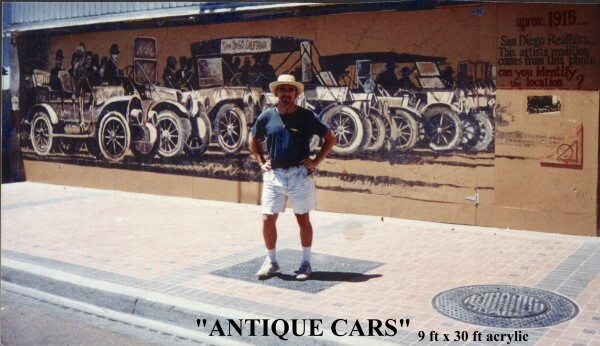 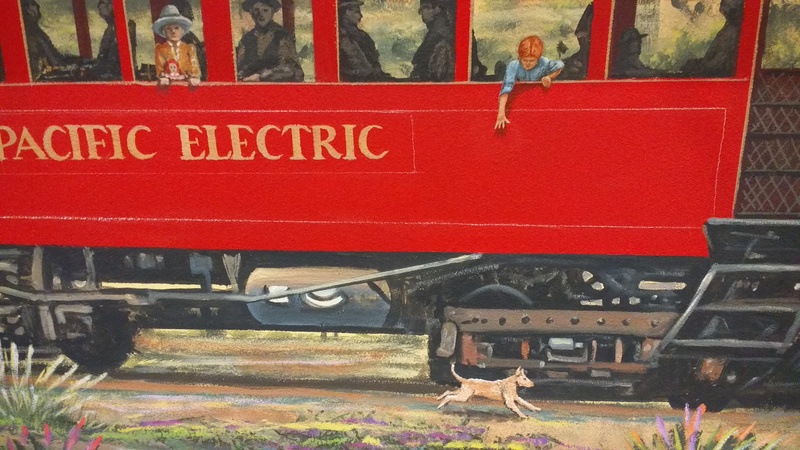 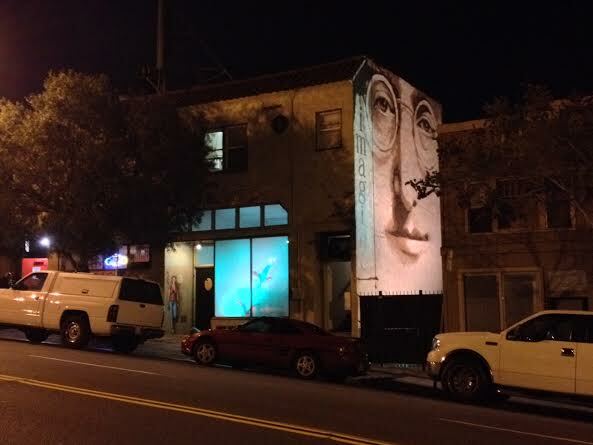 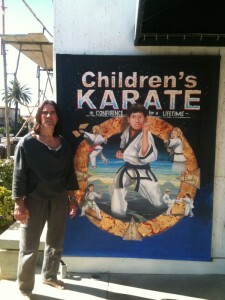 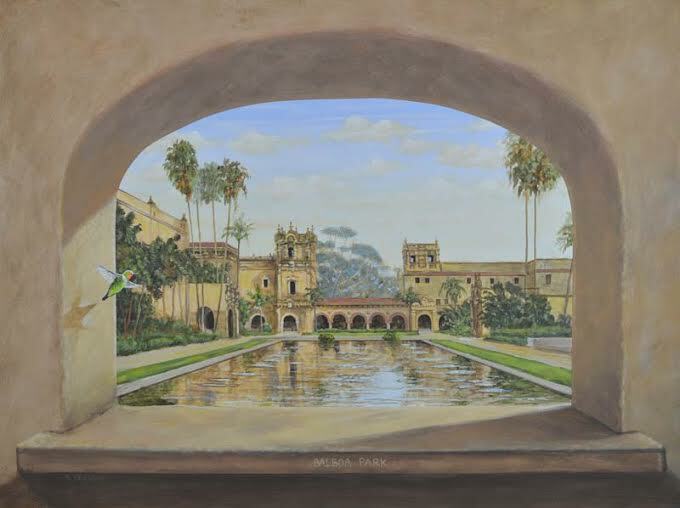 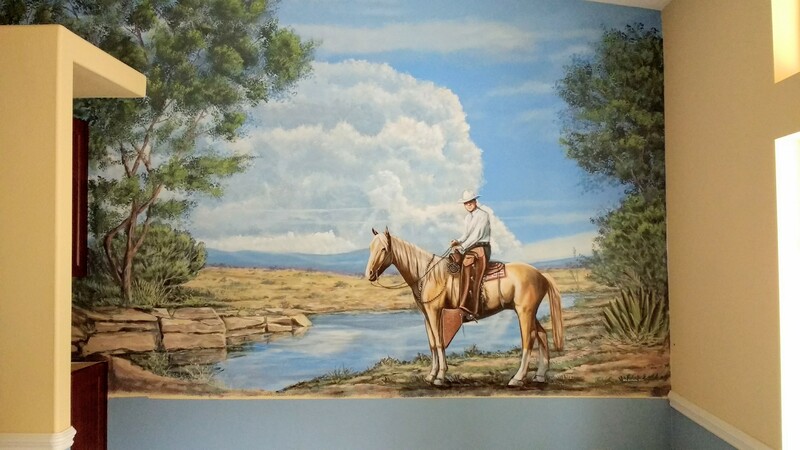 This mural is based on a historic photo of Vicente Yorba in Yorba Linda, California. 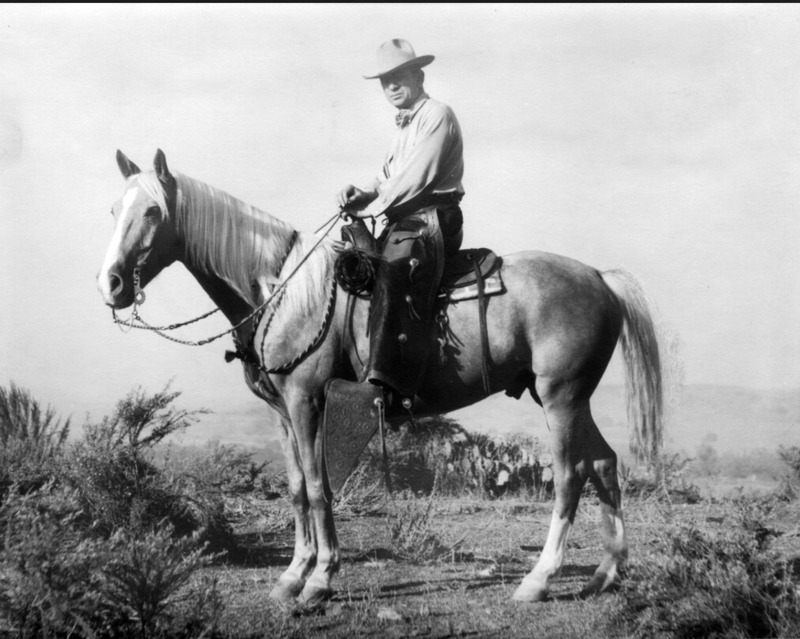 named after his family. 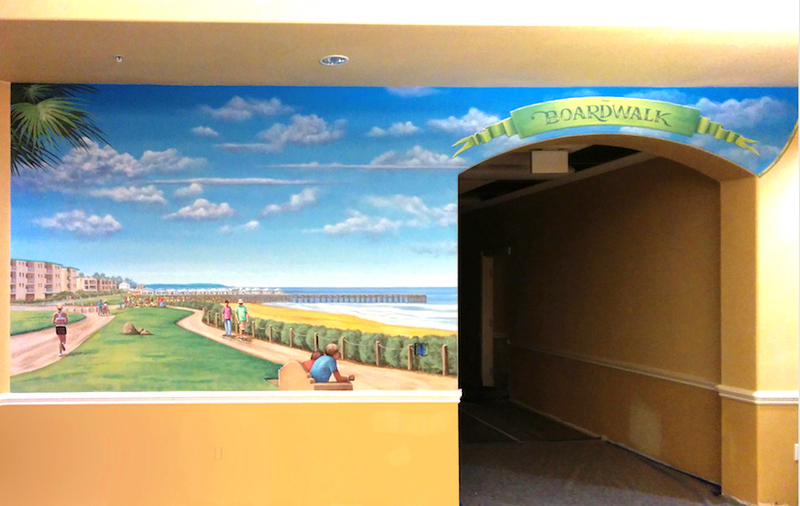 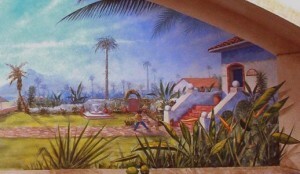 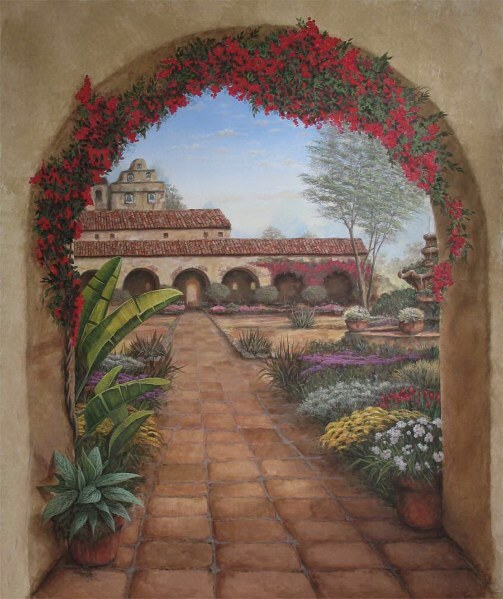 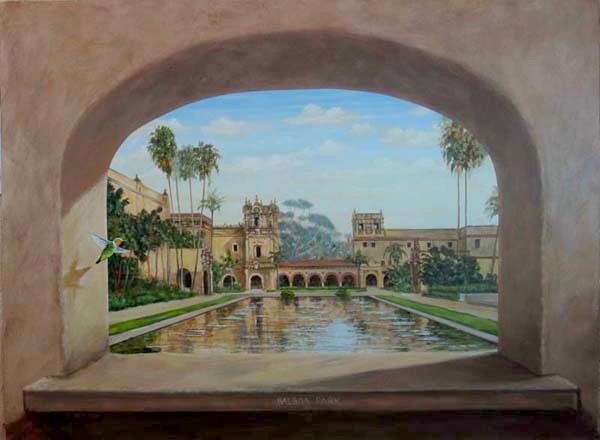 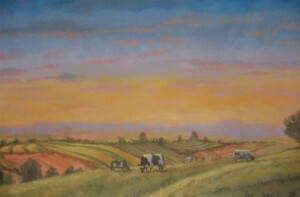 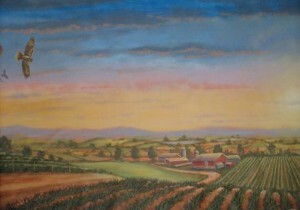 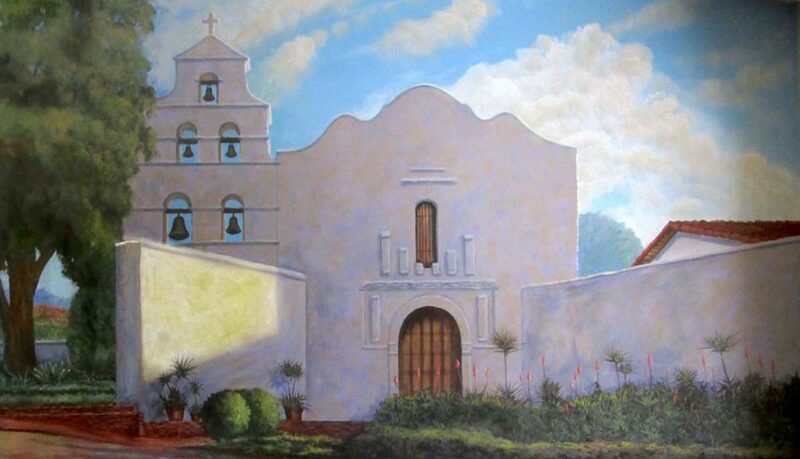 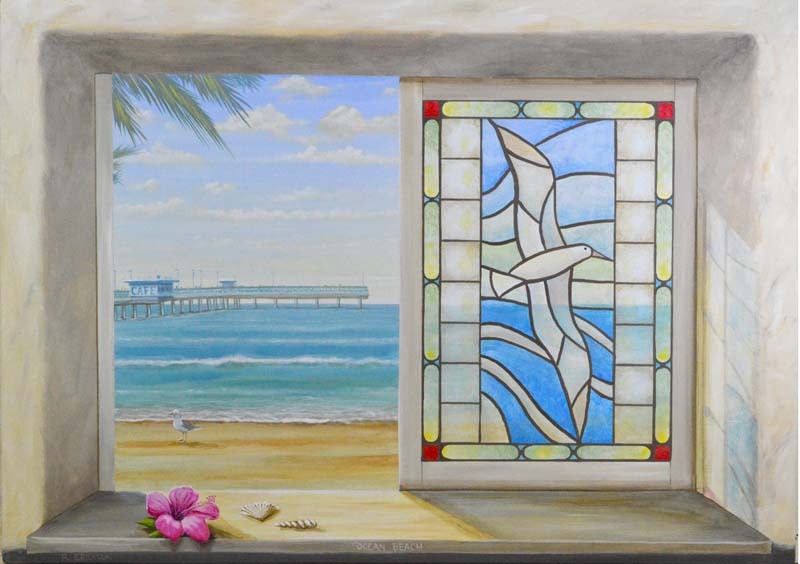 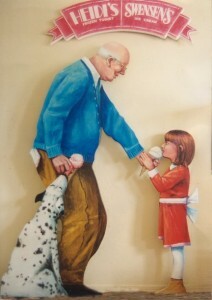 It is one of 5 murals painted for a memory care group based in San Diego. 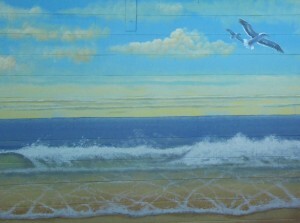 I added color and a background to come up with this concept. 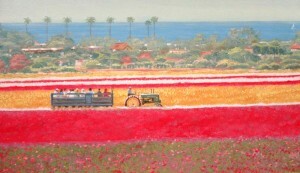 Location – Mission Bay area of San Diego, California. Based on the Mission Beach,Belmont Park roller coaster. 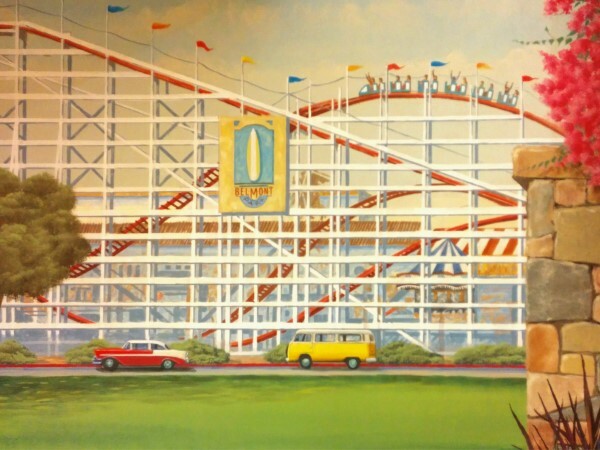 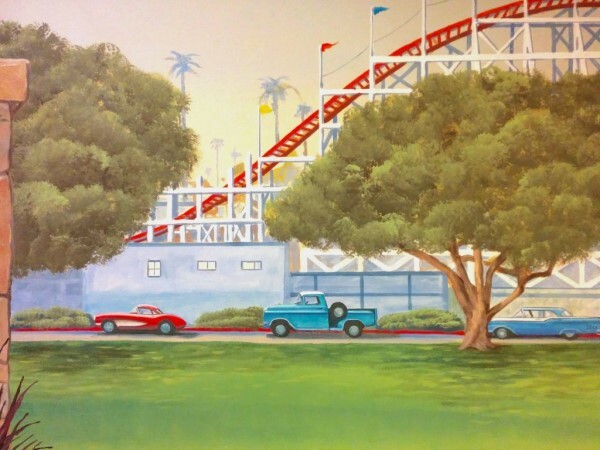 This Belmont Park mural is for a memory care facility in Mission Bay area of San Diego. 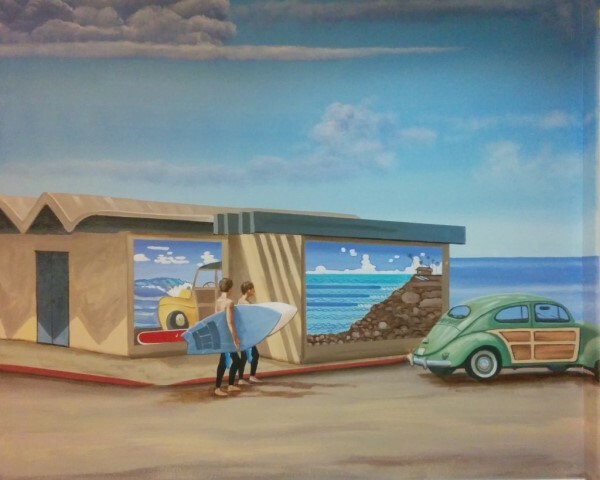 Tourmaline Surfing Park is a beach access point and a surf spot in North Pacific Beach, San Diego, California, USA. 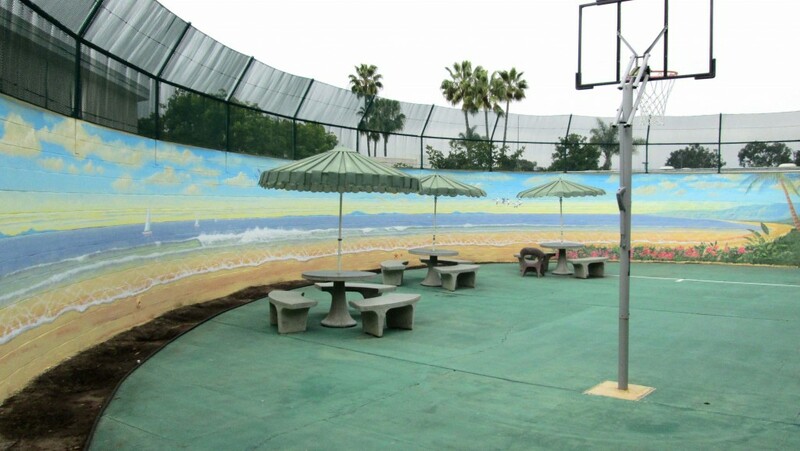 The park is situated at the northern end of Pacific Beach, a short distance south of where the sand beach ends and the rocky promontory of La Jolla begins. There are cliffs to the north and south of Tourmaline Surfing Park, but the park itself lies in Tourmaline Canyon, which cuts down through those cliffs to the beach. 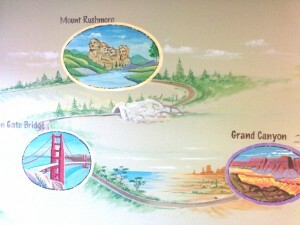 Location – Rancho Bernardo, California. 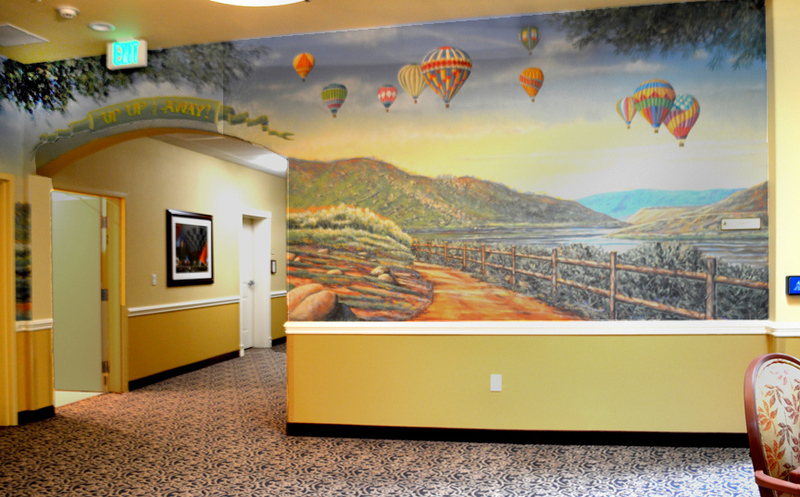 Lake Hodges mural with hot air balloons for memory care facility in Rancho Bernardo, California. 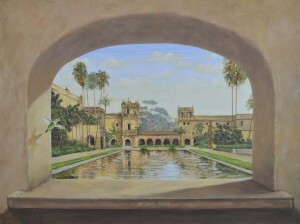 Location – Chula Vista, California. a Spaniard more commonly known as San Diego. 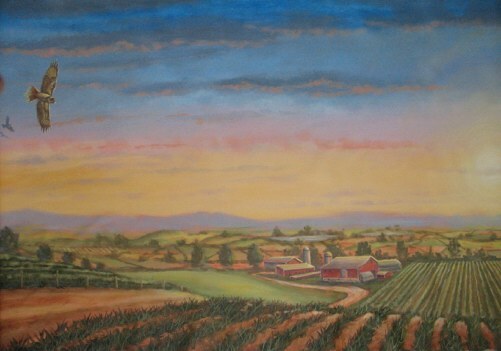 The mission was the site of the first Christian burial in Alta California. 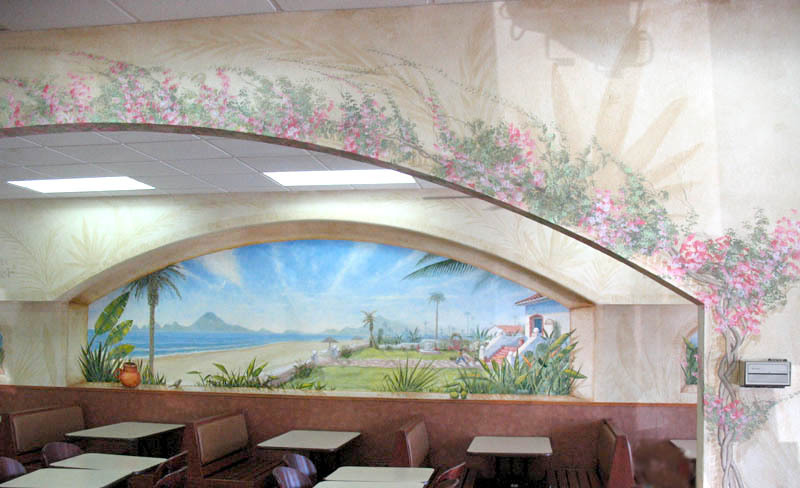 Painted for “Lalo’s Mexican Grill” located in Hillcrest area of San Diego as part of a multi-mural and faux wall treatment. 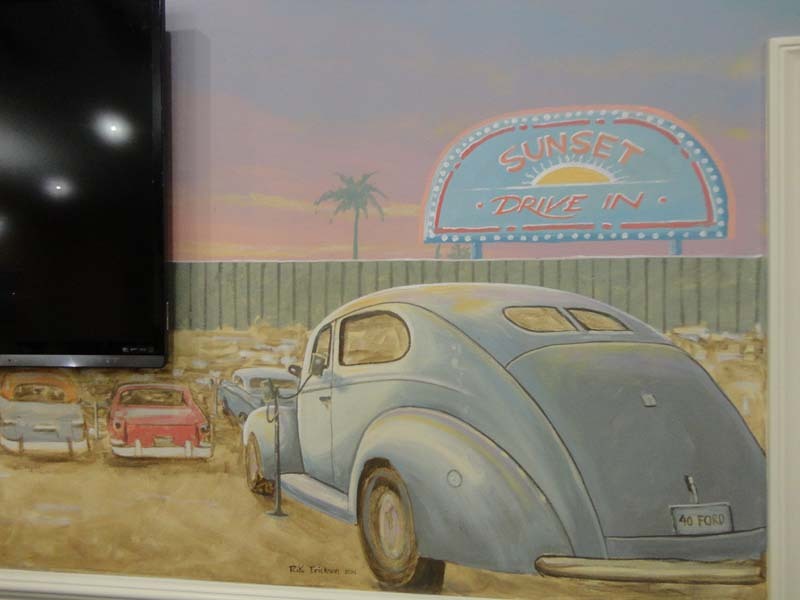 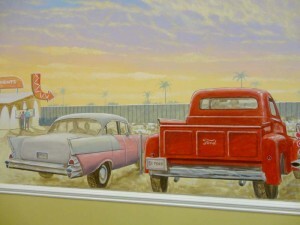 These two murals were painted for the showroom of a Lexus car dealer located in Orange County, California. 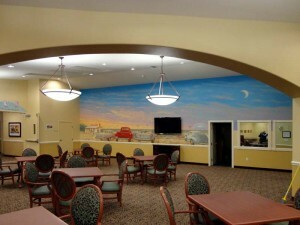 They were painted on canvas and installed onto the wall areas in 3 hours time. 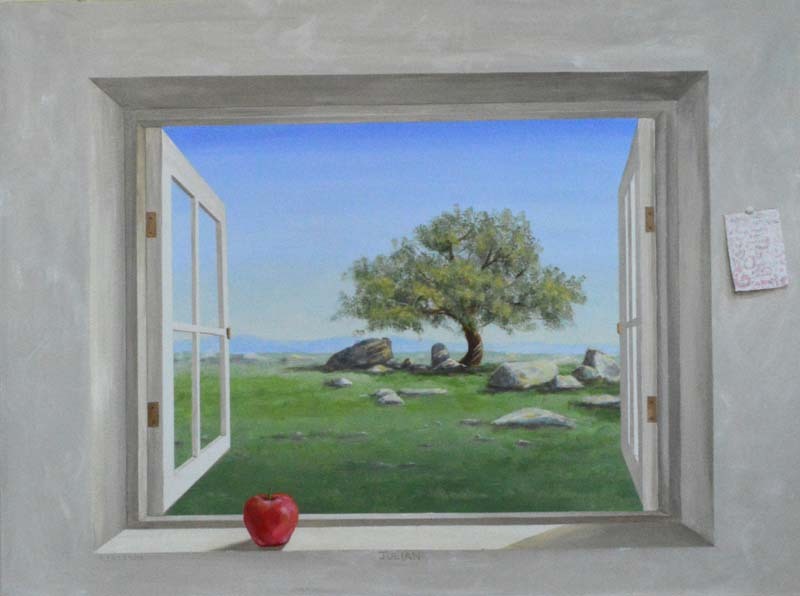 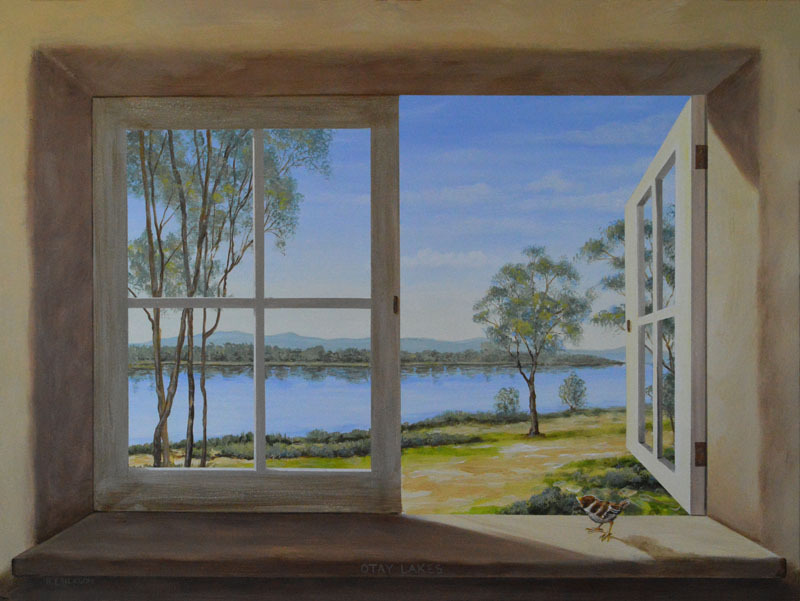 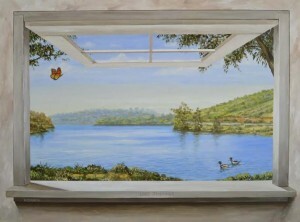 Two windows with characters painted onto blank wall that match third window on far right side. 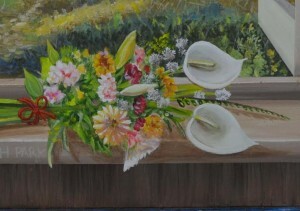 The characters are Julia Roberts and Javier Bardem from the famous movie “Eat, Pray Love”. 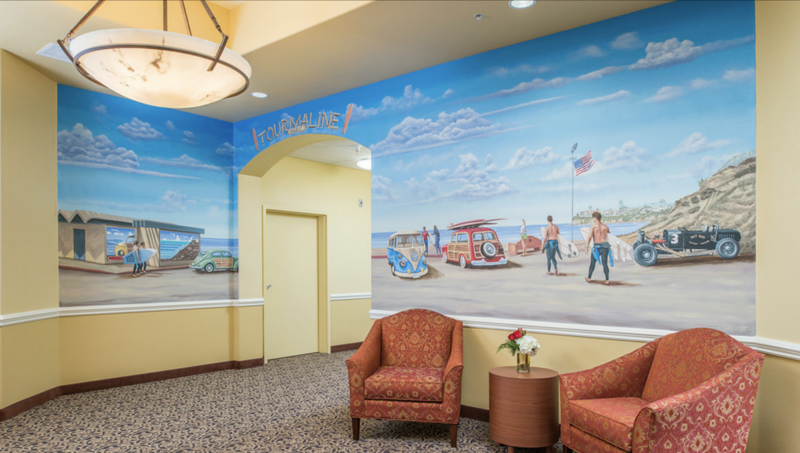 Commissioned by Sharp Memorial Hospital in the San Diego, California area. A Trompe L’oeil (trick the eye) view of the La Jolla Cove with red bougainvillea enclosing the view. 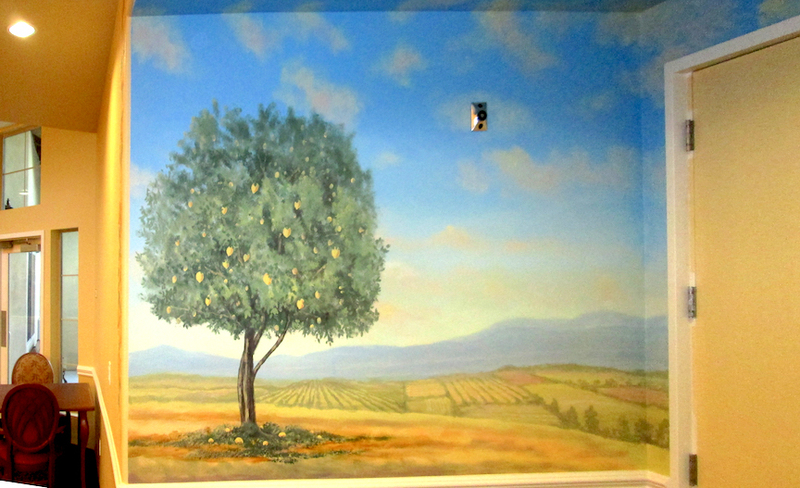 Next to this is a pot sitting inside a niche with a topiary tree below. 3-D construction with children’s characters cut out and attached to rocks. 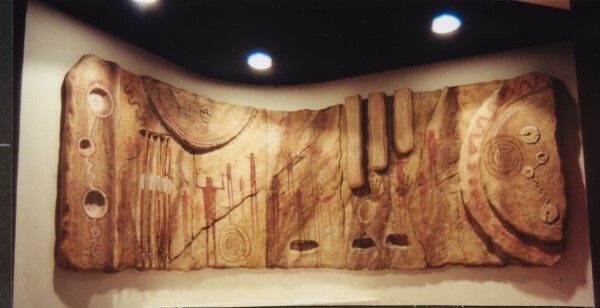 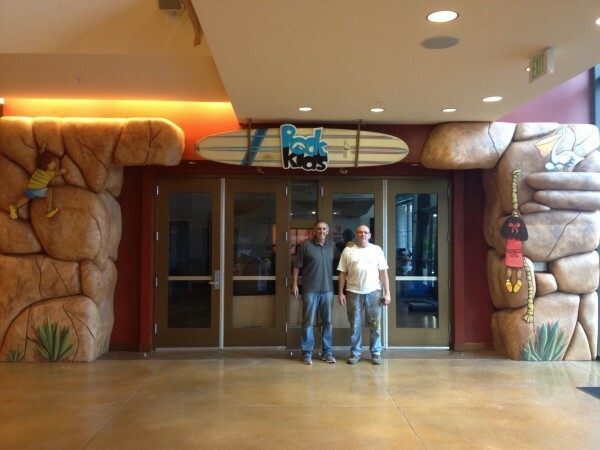 “The Rock Wall” For the Rock Church, Point Loma, CA.